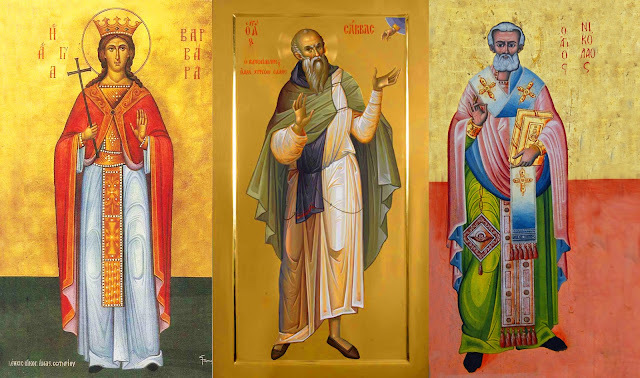 The three saints of Orthodox Christianity below have their Feast Days on consecutive days of early December. These are all popular and well-known saints that are venerated in the Orthodox Christian faith. The first is St Barbara, whose Feast Day is on the 4th of December; the second is St Sabbas, whose Feast Day is on the 5th of December; and finally St Nicholas, whose Feast Day is on the 6th of December. St Nicholas has become the "Santa Claus" of Christmas. We need some more saints these days! I don't mean the worship of saints, but people who are an example of faith, hope and love:) Many thanks for your "triptych" reminds me of it. Also, many thanks for sharing this with All Seasons! have a great week! Beautiful triptych. Thank you for sharing. Excellent collage, Nick and very festive.